A Master Woodsmen's Guild notably improves the quality of archers recruited from the region. 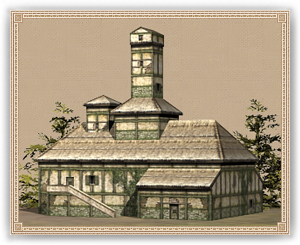 The Woodsmen's Guild Headquarters greatly improves the quality of archers recruited from the region. The Woodsmen’s Guild is more of an organisation of peasants that maintain skills of living off the land that even most trained soldiers cannot lay claim to. Though most of their skills are trade orientated, virtually all guild members can both string and fire and longbow properly with genuine skill. The guild offers its expertise to lords that support its existence without quarrel.